Social Development Centre will be closed on Friday April 19th and Monday April 22nd. Have wonderful holidays. We are in April 2019, almost a year after the Rally of July 2018 in the midst of the municipal pre-election campaign, and still waiting for concrete work being done at the crossing. The train testing has been on for over 6 months and people's lives put at risk every day. Read more from a community advocate James Howe about the struggles and the patience of the residents in Traynor-Vanier. More about our work in this neighbourhood can be found at the Neighbourood Connections page. 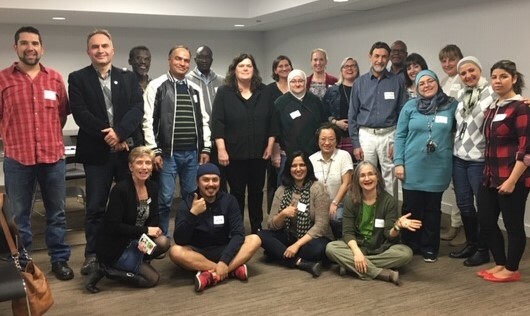 After the Waterloo Region Multicultural Connections Forum, organized in November 2018, together with the Immigration Partnership and the WR Volunteer Action Centre, we followed up on the top priority that the representatives of cultural communities shared: Empowerment of Ethno-cultural Groups. The empowerment includes: access to resources (funding, space, information, communication and mentoring); mutual understanding (common spaces and activities, dialogue building); equity (anti-racism, removal of barriers for participation and representation in decision-making). The Neighbourhood Connections Award has had a deep impact in neighbourhoods across Kitchener. Festival of Neighbourhoods, in itself, seemingly a simple approach, has contributed enormously in building close and loose ties among people in our community. They are our lifeline of access to information and opportunities. However, the Neighbourhood Connections Award, introduced in 2000 by Social Development Centre, helps us work through equity issues to build community capacity. Read about this unique process, welcomed by the Victoria Park neighbourhood in 2019, and more in our March E-Neighbour. Having Fun in the Neighbrrrhood? We have seen some cold spells this winter and we cannot have them discourage us from spending time with our neighbours! Yes, we showell together, and de-ice our sidewalks together, sure, some people bond and have fun this way. There are many paths to take in neighbourhood winterland. Some ideas are in our Winter E-Neighbour, including the 2018 Annua Celebration Inclusion Recognition Recipient neighbourhoods: Doon South, Schneider Creek, Auditorium and New Doon. Next time you organize a neighbourhood gathering in winter, think of the ways to be inclusive of everyone who cannot skate or walk through snow. This year, we will be hosting free income tax clinics. During the tax season, we are offering bookable times, weekend appointments, and drop-off services for your tax return to be completed within two working days. Our clinics start Monday March 4th and will operate until Monday April 29th. In addition to English, we have volunteers that speak Urdu, Hindi, Punjabi, and Farsi. Call or email to schedule a time: 519-579-3800 or tax-clinic@waterlooregion.org. To ensure that your return is completed accurately, please have all of the necessary documents as it applies to your situation from the tax clinic check list. Please note that if you are not receiving Ontario Electricity Support Program (OESP), we can assist you in applying for it, even if not all the household members have filed taxes.